To the Islamic people, the Arabian horse was considered a gift from Allah, to be revered, cherished and almost worshipped. Long before Europeans become aware of his existence, the horse of the desert had established himself as a necessity for survival of the Bedouin people. The very nature of the breed, its shape as well as its color, was influenced by religious belief, superstition and tradition. It was believed that the bulging forehead held the blessings of Allah. Therefore the greater the "Jibbah" the greater the blessings carried by the horse. The great arching neck with a high crest, the "Mitbah" was a sign of courage, while a gaily carried tail showed pride. These traits were held in high esteem and selectively bred for. Traditions of breeding and purity were created to keep the breed "Asil" or pure, in the form intended by Allah. Any mixture of foreign blood from the mountains or the cities surrounding the desert was strictly forbidden. While other, desert type breeds developed in North Africa and the periphery of the Great Desert, they were definitely not of the same blood as Arabians and were disdained by the proud Bedouin. The Arabian horse was primarily an instrument of war, as were horses in general in most societies at the time. Mares were the best mounts for raiding parties, as they would not nicker to the enemy tribe's horses, warning of their approach. The best war mares exhibited great courage in battle, taking the charges and the spear thrusts without giving ground. Speed and endurance were essential as well, for the raids were often carried out far from the home camp, family and children. The value placed upon the mare led inevitably to the tracing of any family of the Arabian horse through his dam. The only requirement of the sire was that he be "Asil". If his dam was a "celebrated" mare of a great mare family, so much the better. Mare families, or strains, were named, often according to the tribe or sheik who owned and bred them. As the world slowly shrank due to increasing travel abroad, the Turkish rulers of the Ottoman Empire began to send gifts of Arabian horses to European heads of state. 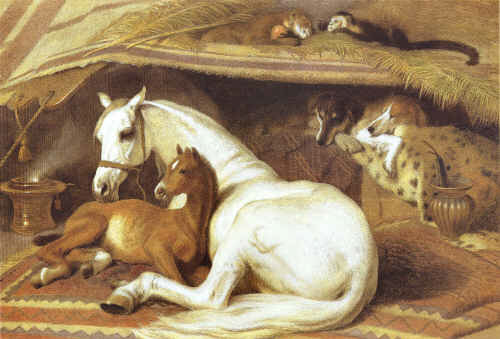 Such was the nature of The Godolphin Arabian (sometimes called "Barb") imported to England in 1730 as well as The Byerley Turk (1683) and The Darley Arabian (1703). 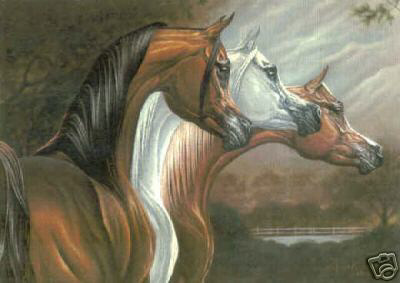 These three "Eastern" stallions formed the foundation upon which a new breed, the Thoroughbred, was to be built. Today 93% of all modern Thoroughbreds can be traced to these three Arabian sires. By direct infusion, and through the blood of the Thoroughbred, the Arabian has contributed, to some degree to all our light breeds of horses. 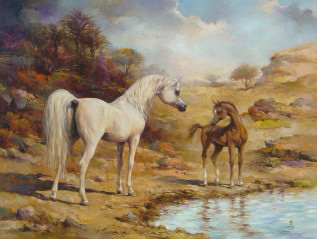 The Bedouins have generally been credited with the beginning of selective pure breeding of Arabian horses. These tribes, kept their breeding records by memory and passed down through the ages verbally, are also credited as the first to keep breeding records and maintaining the purity of the Arabian breed. To this date, many Arabian pedigrees can be traced to desert breeding meaning there is no written record but because of the importance of purity to the Bedouins, "desert bred" is accepted as an authentic verification of pure blood for those early imports. The severe climate required the nomads to share food and water, and sometimes even their tents with their horses. 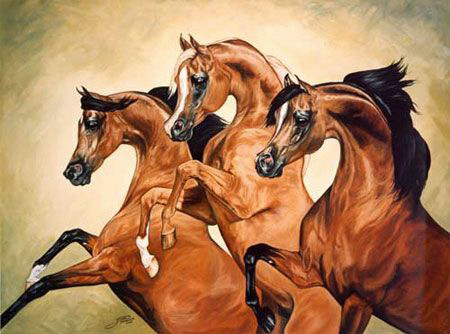 As a result, Arabians developed a close affinity to man and a higher intelligence. Each strain, when bred pure, developed characteristics that could be recognized and identified. The Kehilan strain was noted for depth of chest, masculine power and size. The average pure in strain Kehilan stood up to 15 hands. Their heads were short with broad foreheads and great width in the jowls. Most common colors were gray and chestnut. 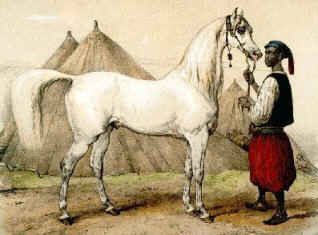 As the oldest of all the light breeds and foundation stock of most, the Arabian horse is unique. 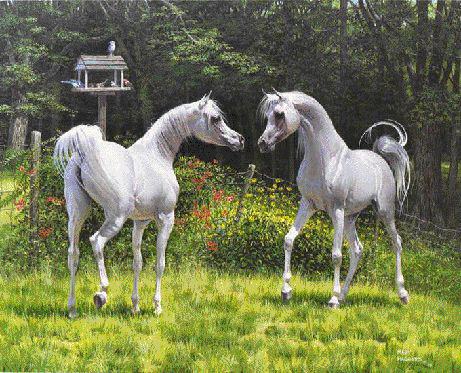 The Arabian breed is different in that it does not exist as a result of selective breeding, as were other modern light breeds, but was a breed that had been recognized for thousands of years and had been maintained and cherished in its purity over those years as much as is humanly possible. The traits that were bred into the Arabian through ancient times created a horse that is not only a beautiful breed, but one that excels at many activities. The high intelligence, trainability, gentle disposition and stamina of the Arabian horse enables it to excel at a wide variety of activities popular today. Considered the best breed for distances, the Arabian's superior endurance and stamina enable him to consistently win competitive trail and endurance rides. As an endurance horse, the Arabian has no equal. The top prizes at endurance events almost always go to riders of Arabians. Arabians are excellent on the trail and track as well as in the show ring. The Arabian is well known for his balance and agility making him very versitile in many areas. Show classes in English and western pleasure competition, cutting and reining, even jumping and dressage provide opportunities for fun and enjoyment at both all-Arabian events and open breed shows alike. Combined with his high intelligence and skillful footwork, he is more than capable in driving and reining events. For speed, agility, and gracefulness, you'll want an Arabian horse as your mount. In addition, the Arabians' Bedouin heritage is evident in their unequaled ability to bond with humans, making them the perfect horse for enthusiasts of all ages. His affectionate personality, loyal, willing nature makes him a great horse for children and the perfect family horse. The most popular activity with all horse owners is recreational riding and the Arabian horse is no exception. Although the most beautiful of all riding breeds, the Arabian is not just a pretty horse. He is an all-around family horse, show horse, competitive sport horse, and work horse.